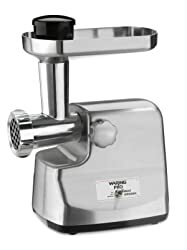 You won’t regret purchasing a meat grinder. It’s going to widen your kitchen experience and improve the way you look at ground meat. 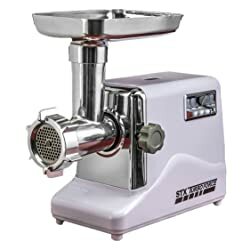 So make sure you choose the best meat grinder for your needs carefully and pick the one that is suitable for your cooking requirements. Perfect inexpensive choice for home cooks and chefs looking for an all-in-one machine. 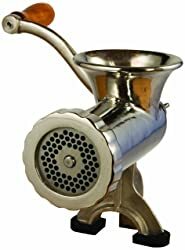 It functions as a meat grinder, a vegetable mincer and as a pasta maker so no need to buy these machines separately. The price is very affordable. The machine itself boasts of 7 inches in height with a 4 and ¼-inch diameter base for a compact, easy-to-hide kitchen equipment. The product is lightweight at 2.2 pounds, thanks to its mostly plastic construction. The whole set will give you mincing, grinding and pasta-making attachments – two types of mincing plates, three kinds of pasta attachments and one sausage funnel attachment. This is a plastic attachment food grinder that works with your existing KitchenAid mixer. Price is cheap, which is great for budget-conscious customers. Completely detachable – after using, remove it from the mixer and wash it with soapy water without a problem. All accessories included come with a 1-year replacement warranty. Construction is plastic including the food tray and sausage stuffer kit so the whole product is very lightweight and doesn’t take up a lot of counter space. The meat and vegetable trays are large, thereby accommodating more meat and veggies in one go. It is easy to keep it hidden when not in use because of its detachable feature. This electric grinder boasts of a whopping 800W to 1HP motor performance. That’s a whole lot of power for an electric grinder that costs so little. Its inexpensive price is one of its best features but we can’t also discount the durable stainless steel construction, the built-in circuit breaker and the hush-hush motor performance. It weighs about 8.8 pounds and has a height of 13.6 inches, giving you so much room to groove in your kitchen. 1 year manufacturer warranty is included in your purchase along with 3 reliable stainless steel cutting plates, 3 types of sausage attachments, 1 cutting knife and 1 food pusher. This is a motorless food grinder attachment that operates when you hook it up to your KitchenAid mixer. The whole equipment only has a meat try and a grinding mechanism attached at the bottom. With a stainless steel construction, this equipment is a cinch to clean. 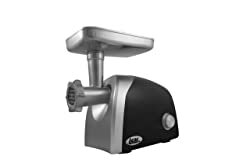 For an attachment, the price is a little on the expensive side but still quite affordable if you compare it to other meat grinders. It weighs only 2.1 pounds and has dimensions 8.8 x 4.8 x 8.5 inches – it doesn’t take up so much space and is easy to keep in your kitchen cabinets. Though it doesn’t have a motor, it comes with a one year limited warranty. 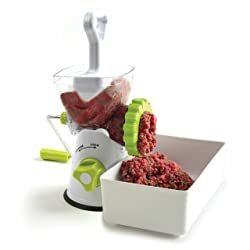 This mid-priced electric meat grinder can be displayed proudly in your kitchen. 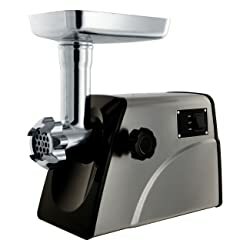 A tad pricier than other electric grinders but still worth the money with its 650 Watt motor power that allows pounds and pounds of meat to be ground in very little time. Comparatively, it’s a little heavier at 7.12 pounds but it still boasts of a compactness that can allow you to use this even in limited counter space. This machine is also one of the few electric meat grinders with forward and reverse speed settings. 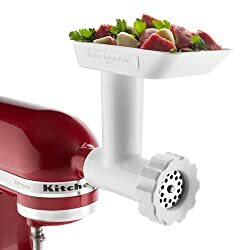 Only three stainless steel plates are included (choose from 3, 4.8, 8 mm coarseness settings) but worth the deal with the large stuffing tube, sharp cutting knife and durable meat stomper included. This is a hand grinder that does not have a motor and has a durable, rust-resistant, stainless steel construction all-over. With its impressive construction, it is pretty inexpensive at its price range. This product weighs less than 8 pounds and has a wide-mouthed clamp that can accommodate different thickness of counter tops. Accessories included are 3/8 inches of coarse plate and 3/16 inches of fine cutting plate. You also get stuffing tubes with sizes ½ inches, 3/5 inches and 7/8 inches, as well as a stainless steel knife. This manual machine boasts of a wide meat opening compartment that allows you to shoot meat with ease. A rotating lever is used to grind the meat. Very convenient to use if you have frequent power interruptions in your area and there’s no need to maintain a motor. 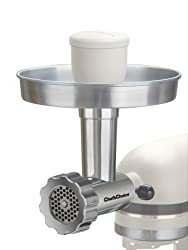 It is a superb mid-priced electric grinder that offers 450-Watt heavy-duty motor, great for grinding large batches of meat. What’s even more impressive is its 5-year warranty for the motor that will surely make any customer feel secured about their purchase. This machine allows so much flexibility with its reverse switch settings, large meat plate and 3 different cutting plates. Weighing 12.8 pounds, it might be a tad heavier than other electric grinders but that’s forgiven due to its wear and tear-resistant stainless steel construction. Whether you are grinding meat, making purees and soups or creating baby food, this machine can come to your aid. It’s very resilient and flexible to use. The detachable parts are very easy to wash in soapy water and the motor does not need rigorous maintenance. One of the electric grinders on the lower to mid-price range. You can say it is affordable since it offers 3000 Watts maximum power – which is more than what more expensive electric grinders can offer you. Also, it has high, low and reverse speed settings, which allow users more flexibility in the quality of their ground meat. The whole thing weighs about 12 pounds and stands at 14.5 inches – taller and heavier than its competitors but the difference is negligible. It also boasts of a No. 12 grinder – which is great if you want better output for your ground meat. The three grinding plates included are made from tempered. Buy this and enjoy your 1-year parts and labor warranty. Definitely one of the priciest electric meat grinders out there but still worth buying because of the almost commercial-grade features. 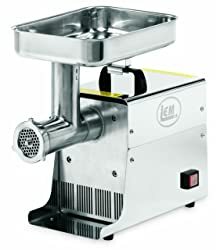 Its .35 HP motor will not run out of juice – powerful in grinding all types of meat, in very big batches so you can grind in one go and save so much time and effort. This thing weighs about 36 pounds – significantly heavier than other electric grinders but has durability that can withstand every day wear and tear. It also includes 2 years parts and labor warranty so your purchase is secured. This is highly recommended for heavy users, cooks, chefs and even restaurant owners. CHECK IT ON Amazon.com ! This pricey electric meat grinder doesn’t pull any punches when it comes to motor power. 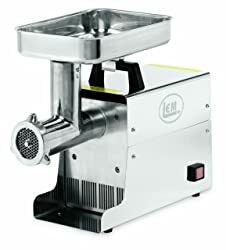 This offers .75 HP motor juice coupled with size #12 grinder so ground meat comes out excellent and commercial quality all the time. Expect it to be a bit heavy because of is 47-pound weight but this should be a con you can overlook if it means getting a heavy-duty machine that does not break down easily. Like most LEM products, it also comes with a 2-year warranty – all parts and labor covered. Included in the package are three types of cutting plates, three kinds of sausage stuffing tubes, one cutting knife, one durable meat stomper and a Big Bite auger. Highly recommended for those looking for excellent ground meat quality and those looking for something heavy-duty.